Located on Corriente River and very close to the Parana, Esquina is a typical provincial village, about 373 miles from Buenos Aires. This destination is well known by anglers and hunters because of the good fishing of dorado, pacu and surubi on one hand, and ducks, partridges and mount pigeons on the other. Located on Corriente River and very close to the Parana, Esquina is a typical provincial village, about 373 miles from Buenos Aires. This destination is well known by anglers and hunters because of the good fishing of dorado, pacu and surubi on one hand, and ducks, partridges and mount pigeons on the other. Situated in Corrientes province in the northeast of Argentina, Esquina offers a tropical weather throughout the 8 months of the fishing season. The season starts in September and runs through May. 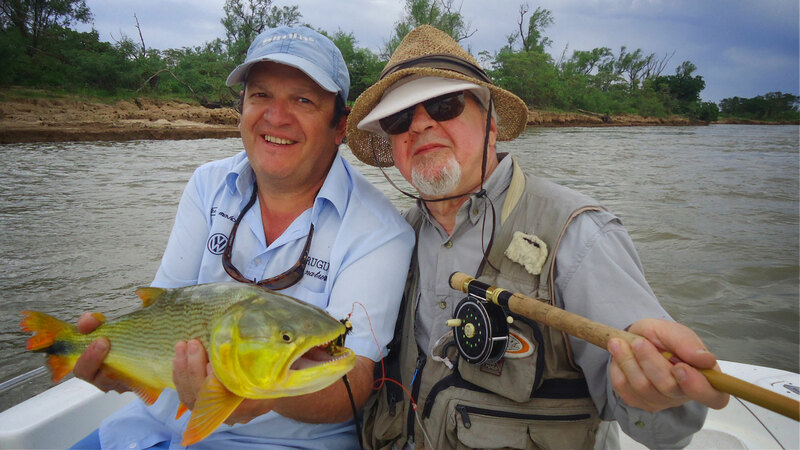 Corriente River and the huge delta covering over 31 mls with hundreds of channels, streams, brook and marshlands are home to a great flora and fauna, making the place perfect for dorado fly fishing. Depending on the condition of the river and its brooks and channels, you may cast on sight with floating lines and surface flies. Fast sinking lines are a good choice to fish the runs and riffles where the larger dorados hide. 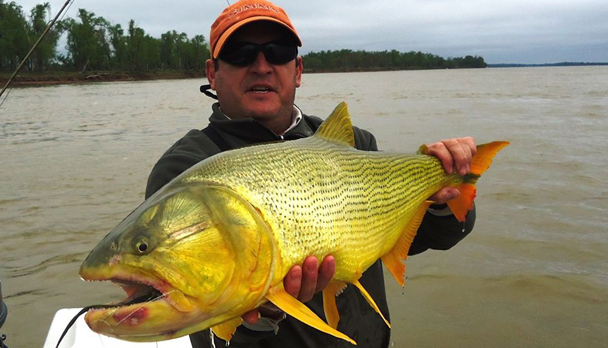 You may also fly fish for chafalote, sometimes reaching one meter long, palometa or piranha, tararira and cabeza amarga. The river shows white sandy shores along some sections which allow wading for dorados. 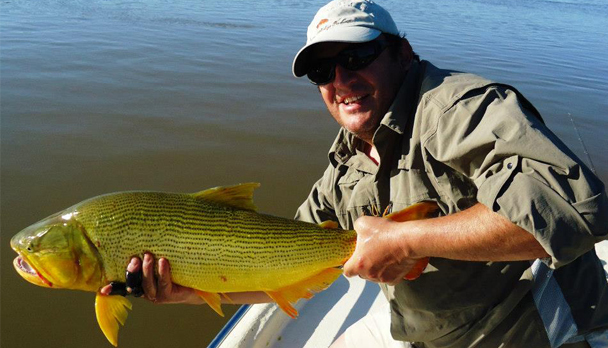 Known as "the river tiger", the dorado (Salminus Maxillosus) is the most exciting native game fish of South America. Even though it is found all year round, the best time of the year runs from September through May. The average size in the area ranges from 4.5 to 17 pounds; however, larger fish are caught every year. All the anglers are accompanied by a professional guide who knows the best fisheries and dorado�s favorite spots using fully equipped boats to cast from the bow and with the appropriate safety equipment. In addition to great fishing the lodge offers a wide variety of activities. Depending on the time of the year, the fishing day starts early in the morning and finishes in the afternoon, with a short break to have lunch in one of the picturesque slopes at the shade of the carob trees. When it is very hot you may prefer to go back to have lunch at the lodge, go for a swim at the swimming pool, take a nap and return to the river until late in the evening. double rooms of superior categories and an all inclusive regime. Air conditioning, heating, handcrafted breakfasts, delicious meals and the good quality in wines. During the summer you can enjoy the swimming pool. For line #7 or 8, 9 to 10 feet long. Any high-performance reel will do. Strong brake system, with at least 150 yards of 20-pound backing. WF floating line for tropical weather. We recommend Ultra 3 bonefish taper of Scientific Anglers. Also, fast-sinking shootings Teeny T-200 and T-300. For floating lines from 7 to 9 feet long, with strong butts to turn big flies, 16-pound- resistance tippets, with 20 cm of 20-pound steel wire. Deceiver type, sizes should range from 2/0 to 3/0. Poppers and divers with muddler head and weighted are also used. Black, black and red, black and yellow, chartreuse, white and yellow and olive have proved good color options. Accessories: Pincers, hook sharpener, a pair of pliers, polarized glasses, sun block, lip protector, insect repellent, neoprene wading boots, a weighting scale, etc. Clothes: Light shirt and trousers for tropical weather (Exoficcio, Patagonia, Columbia, etc), hat, sandals, and a light water-proof jacket. Rates include: 4 fishing days with boat and 1 guide each 2 anglers and 4 night accommodation with private bath. All meals and beverages. Rates do not include: Transfer to Lodge. Fishing equipment and flies; personal insurance; fishing license; gratuities and other personal expenses. Notes: Ask for other options, more days fishing, accommodation and special packages !!! 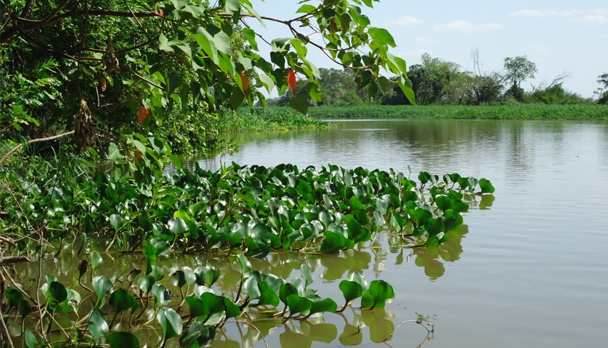 Now the fishing is excellent, big golden dorados, pacu and catfish all over the place, as well as pir� pit�. The water is high and clear, but slowly is descending which is also good.